In the recent years, stand up paddle boarding has grown to new heights. Even though it is growing more than ever, it has been around for decades. Thought to have been invented by the Hawaiians, they first used it for training during the summer surfing season to stay fit when the waves were small and not challenging. It was also used as a way for instructors to maneuver around quickly to attend to people learning to surf. By implementing paddle boarding, surfers were now able to stay in the water when there was small surf and get great cardio exercise at the same time. It is now a main stream sport. People use it to simply enjoy a day on the water, enjoy time with family and friends, and to also increase their fitness. Paddle Boarding can really provide a great workout for you. It will make use of both your strength and balance in order for you to keep in an upright position and move forward through the water. The different levels of intensity you might experience will depend upon the surround conditions you are boarding in. For instance, if you choose to paddle in the ocean, you will likely be fighting a lot of waves as well as the oceans current, so this would rate much higher on the intensity workout level. If you choose to just paddle around a calm lake, then it will result in a much lower for of intensity. Wind can also play a strong factor as well. You can really get a great core workout paddle boarding. You will be using almost every muscle in your body when you SUP. A critical part of boarding is your balance. You tend to use a lot of leg muscles while you attempt to maintain proper balance on the board. In addition to your core, paddling really hits the back, arms, and shoulders as you paddle. While you paddle your back and abs are constantly firing to help you maintain proper balance. It really is great. Most people don’t take into account that SUPing is considered a low impact exercise. There are not a lot of heavy or jerking motions, just long and smooth which is great. Because of this, you are not likely to do any damage to any of your ligaments, tendons, or joints in general. A workout such as lift weights at a gym, is considered more of a high impact workout. You are more likely of an injury lifting weights than paddle boarding. SUPing is great for runners that may be dealing with knee or hip pain as well as shin splints due to its low impact. You also still get the benefits of burning a lot of calories on top of it all. It is a really great form of aerobic and strength training. There are many health benefits to stand up paddle boarding and one of the best is that it is a very safe workout and easy on your body while you reap the benefits. Greatly improve your cardio fitness levels. Help decrease your likely hood of stroke or heart attack. Significant weight loss when done on a regular basis including a proper diet. Increase Lung capacity and oxygen intake. Relaxing on the mind and body. Time to connect emotionally with nature. I’m sure there are more but you are starting to see the greatness of it and why it is one of the fastest growing sports in the world. Maybe you have tried surfing and it was just a little to difficulty for you. It does take some of the most balance of any sport, but you still just want to get out in the water. You might even have friends that surf and you want to still join the fun with them, but you just can’t get it down. With paddle boarding, it still gives you the opportunity to get out there and have fun with your friends catching waves. You can even taunt them a bit as you will be able to catch the waves much sooner then they will be able to. There are a lot fo upsides. Keep in mind, once you get good a paddle boarding and your balance increases, you can always switch back over and try surfing again. It will be much easier once your balance has improved and you get comfortable on the water. A lot of surfers do both sports. I am one of those. Yoga boarding is the new thing. Talk about taking balance to a whole other level. If you want to ignite your stabilizing muscles, this is surely a great way to do so. 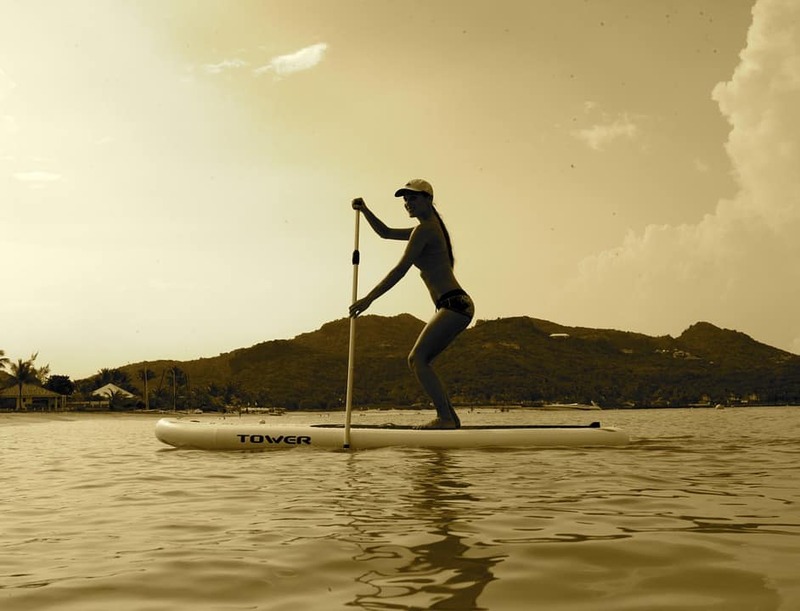 Performing yoga on a SUP adds an extra balance requirement. This is great for someone who has been doing yoga for a long time and could use a change of pace to keep things fresh. For a novice and beginner, this might be a little too challenging to start off. The other great part is that you get to perform the yoga outside in the elements VS being in a stuffy class room in a gym with little sun and fresh air. It really just adds a whole new great experience. If you are interested in yoga boards, check out our paddle boards for sale page. A lot of people can be undecided when it comes to buying a standup paddle board, although, once they understand all the added benefits they will get and joys it has to offer, they tend to come around and at least give it a try. Why wait? When is now a good time? Give it a shot, you won’t regret it! You can find more great articles by checking out our paddle boarding blog as well. Thanks for reading and be sure to leave any comments or thoughts below.